I’ve been playing around with this recipe for a few months now and I think I finally have a name for it, the Breakfast Pie. The beauty of this Paleo Paramedic Original Recipe is that it can be mixed with almost anything, it is very versatile (and not just for breakfasts either). The ‘pie’ is made up three ingredients but a large number of ingredients can also be added to make each one you make different. I have listed several ‘filling’ suggestions at the end, however on its own it is still delicious and very warming. I would also recommend it for beating away any winter blues or low feelings, it does feel like a warm hug in a bowl (at least it does to me, try it and see if you agree). The recipe works best with a deep soup bowl to serve and a small frying pan to make the ‘pie lid’, the small frying pan I used is roughly the same diameter as my bowls. I’d always recommend having a small frying pan as it is very handy for cooking vegetables as well as frying eggs. The recipe should be eaten on the day however if you make excess sweet potato mash then this can be kept in the fridge for one to two days provided it is cling filmed. You can always use it to make fish cakes or a topping for a cottage pie. Boil the kettle. While the kettle is boiling peel and chop the sweet potatoes into discs, the thinner you make them the quicker they will cook but they should not be wafer thin. Boil the sweet potatoes over a high heat until soft. While the sweet potatoes are cooking you can prepare and cook any extra filling you want, see below for suggestions. Once the potatoes are cooked, drain and put back in the pan with a generous amount of butter. Once softened, mash the potatoes, add more butter if needed. Season well with white pepper. Heat a small amount of olive oil in a small frying pan over a medium-high heat. Crack in the two eggs (try to keep the yolks in tact and away from the edge of the frying pan). Fry the eggs for 2-3 minutes to ensure a runny yolk. Keep going around the edges with a pallet knife to ensure it doesn’t stick. Combine or add the extra filling to the sweet potato and put into a bowl. 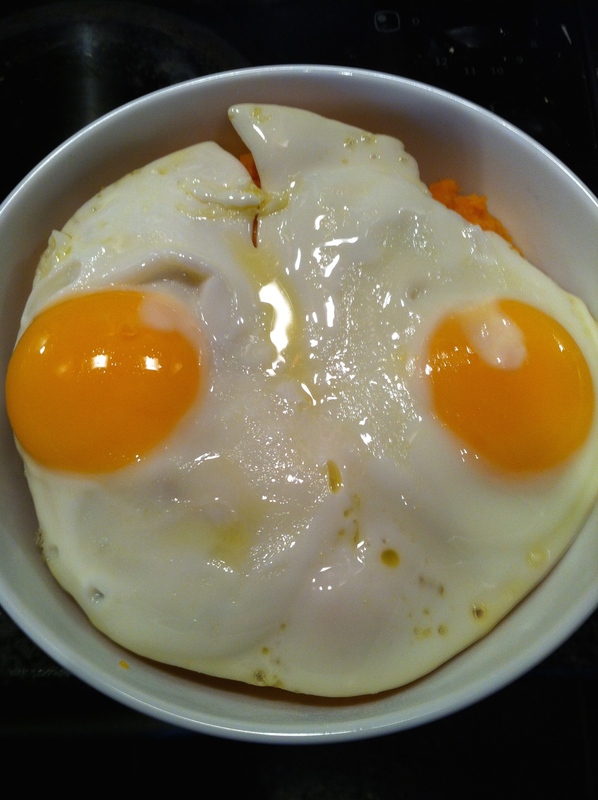 Gently slide the fried eggs over the top of the bowl, break into it and enjoy. There are potentially hundreds of different fillings, left-overs along expand the possibilities greatly, here are several of my personal favourites. If you have any suggestions please comments, always love hearing from my followers with recipe ideas. Sun-dried Tomatoes – Add 8-10 chopped sun-dried tomatoes to the sweet potato mash before adding it to the bowl. Mackerel – Flake in some smoked mackerel to the cooked and mashed sweet potato before adding it to the bowl. Black Pudding – Whilst the sweet potatoes are boiling, grill a piece of black pudding in the oven for 6-8 minutes ensuring you turn it half way through. 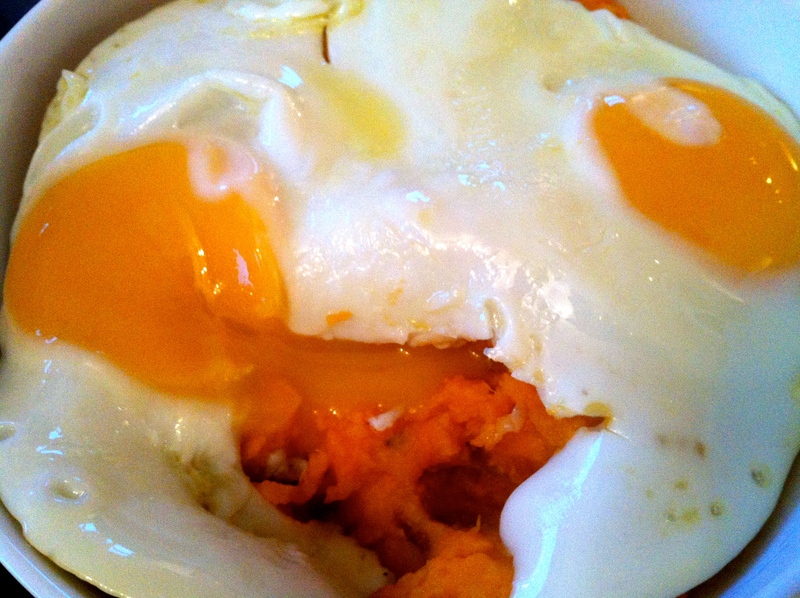 Add the mashed sweet potato to the bowl, place the black pudding on top and then cover with the eggs. Left Over Mince – If you have any left over cooked mince from the night before, add it to the sweet potato mash before adding it to the bowl. Kale – Whilst the sweet potatoes are boiling, fry up some kale with a little olive oil and add, once cooked, to the sweet potato mash. Mushrooms – In a separate frying pan, fry some chopped chestnut mushrooms with some butter and sage (as I have used in some of my other recipes). Once cooked, add to the sweet potato mash. Carrots – Before boiling the sweet potato add two chopped, medium carrots to the water and boil for an extra couple of minutes before adding the sweet potato. 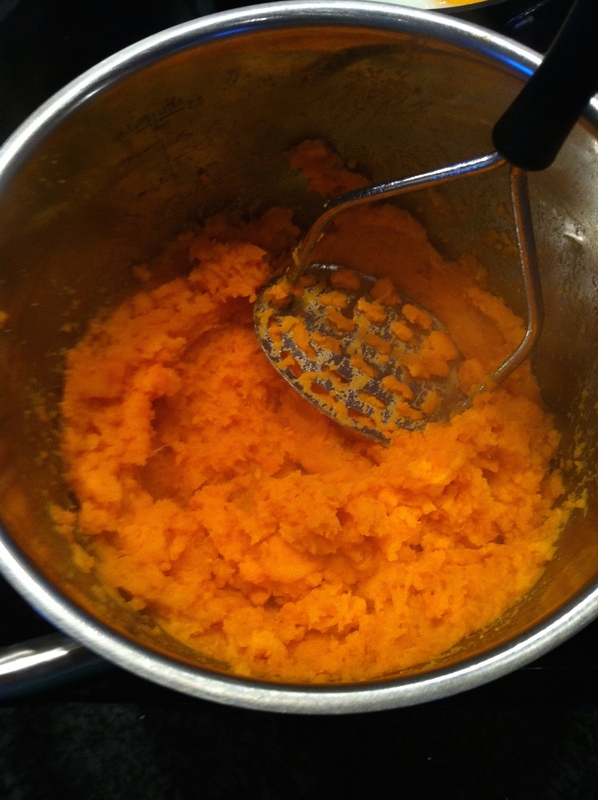 The carrots will take longer to cook than the sweet potato to always ensure that the carrots are soft before attempting to mash with the butter. Grated Courgette – Whilst the sweet potatoes are cooking, grate and fry a courgette in a small amount of olive oil, ensuring it doesn’t all clump together (you might find it easier to dab it dry with some kitchen roll before cooking to help remove some of the water). Add the sweet potato mash before adding to the bowl. Truffle Oil – For true decadence add one teaspoons of truffle oil to the sweet potato mash before adding the eggs. If you’re feeling really decadent and have access to them, shave in a couple of pieces of black truffles as well. Making everyday foods an enjoyable and satisfying must-have. 80/20 kitchen adventures of a girl who loves food just as much as she hates wall balls. life without grains... WHEAT IS MURDER!